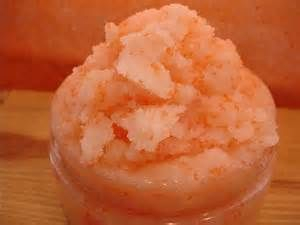 This scrub is a bit on the "oily" side... but will absorb nicely into your skin leaving it very smooth and supple. Refreshing and mood uplifting...a fragrant blend of Blood Orange and Apricot. A unique mix of moisturizing Shea Butter, natural fruit extracts and refined sugar lift and remove dull skin cells. Scrub rinses clean leaving skin feel super baby soft. Gently sloughs away dull skin, leaving a revitalized smooth feel. Not just oils and sugar... there is no pooling of on the surface. Its more like a soft sugar paste with 15% Shea Butter and honey as a base. Includes natural oils, Vitamin E and an essential blend of blood orange and apricot. Contains the Essential Oil blend of Blood Orange and Apricot. Weekly "scrubbings" promote circulation and lymphatic drainage. Scrubbing provides a much better absorption of lotions or creams - all the while maintaining youthful and hydrated skin. Sugar scrubs are GENTLER than salt scrubs. They will not sting - and are good for all skin types.